HOUSTON  (February 15, 2011)  Despite the bone-chilling winter weather, Houston's housing market heated up in January, recording the first increase in property sales since June 2010. Pricing also heated up in the first month of the new year, with the average price of single-family homes reaching the highest level ever for a January in Houston. January sales of single-family homes throughout the Houston market rose 7.5 percent when compared to January 2010, according to the latest monthly data compiled by the Houston Association of REALTORS® (HAR). Positive activity was recorded in all segments of the housing market, with the sharpest increases in sales volume taking place at opposite ends of the pricing spectrum. Luxury home sales helped propel the average price of a single-family home, which increased 2.2 percent from January to $196,879. The January single-family home median pricethe figure at which half of the homes sold for more and half sold for lessdipped 3.2 percent from one year earlier to $139,000, due to hefty sales volume among homes priced at $80,000 and below. Foreclosure property sales reported in the Multiple Listing Service (MLS) declined 4.7 percent in January compared to one year earlier. Foreclosures comprised 24.7 percent of all property sales in January, down from the 26.7 percent share they held at the beginning of 2010. The median price of January foreclosures fell 4.0 percent to $80,600 on a year-over-year basis. January sales of all property types in Houston totaled 3,413, up 9.5 percent compared to January 2010. Total dollar volume for properties sold during the month was $643 million versus $574 million one year earlier, representing an 11.9 percent gain. "Houston's residential real estate market has definitely gotten the new year off to a healthy start," said Carlos P. Bujosa, HAR chairman and VP at Transwestern. "Housing inventory appears to be balancing out, but the economy as a whole remains somewhat fragile, so I believe we need to see how home sales perform in the next month or two before being able to accurately predict what 2011 has in store for us."" The month of January brought Houston's overall housing market positive results when all listing categories are compared to January of 2010. Total property sales, total dollar volume and average price all rose on a year-over-year basis while the median single-family home sales prices dropped slightly. Month-end pending sales for January totaled 2,984, up 7.2 percent from last year. That suggests the likelihood of further strengthening in demand when the February figures are tallied. The number of available properties, or active listings, at the end of January rose 9.5 percent from January 2010 to 49,253. Despite the increase in sales volume, growth in available housing pushed the January inventory of single-family homes to 7.3 months compared to 6.1 months one year earlier. The figure still compares favorably to the national inventory of single-family homes of 8.1 months reported by the National Association of REALTORS® (NAR). January sales of single-family homes in Houston totaled 2,766, up 7.5 percent from January 2010. This marks the first increase in sales volume since June 2010, when the beneficial effects of the last homebuyer tax credit tapered. Broken out by segment, January sales of homes priced below $80,000 surged 26.3 percent; sales of homes in the $80,000-$150,000 range climbed 9.0 percent; sales of homes between $150,000 and $250,000 edged up 2.5 percent; sales of homes ranging from $250,000-$500,000 rose 3.9 percent; and sales of homes that make up the luxury marketpriced from $500,000 and upincreased 17.6 percent. The average price of single-family homes in January was $196,879, up 2.2 percent compared to one year earlier. That is the highest level recorded for a January in Houston. At $139,000, the median sales price for single-family homes dipped 3.2 percent versus January 2010. The national single-family median price reported by NAR is $169,300, illustrating the continued higher value and lower cost of living available to consumers in Houston. HAR also breaks out the sales performance of existing single-family homes throughout the Houston market. In January 2011, existing home sales totaled 2,423, a 16.2 percent increase from January 2010. The average sales price rose 4.0 percent to $185,258 compared to last year, while the median sales price of $128,500 slid 2.7 percent. The number of townhouses and condominiums that sold in January increased 10.7 percent compared to one year earlierthe first sales volume increase recorded since June 2010. In the greater Houston area, 279 units were sold last month versus 252 properties in January 2010. 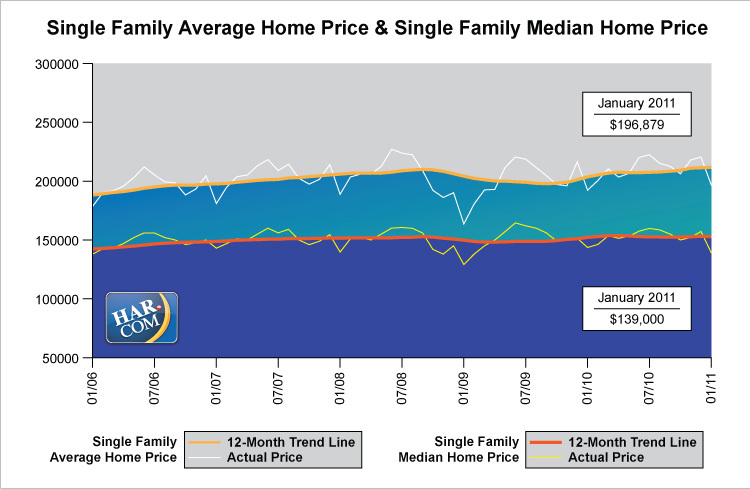 The average price dropped 3.5 percent to $142,164 from January 2010 to January 2011. The median price of a townhouse/condominium declined 8.9 percent to $104,000. Demand for single-family home rentals soared 27.5 percent in January compared to one year earlier. Year-over-year townhouse/condominium rentals increased 24.0 percent. 7.3 months inventory of single-family homes compares favorably to the national average of 8.1 months.